The weirdest thing about this ostentatious centerpiece is that it’s not one of a kind. This Crystal épergne is an actual thing. There is not the only one. It has a definition* Personally, I don’t see the allure of a shiny, pokey, baskety thingy that would break in five minutes if put to actual use. Me, I’d rather just stick with a bowl of plastic fruit. 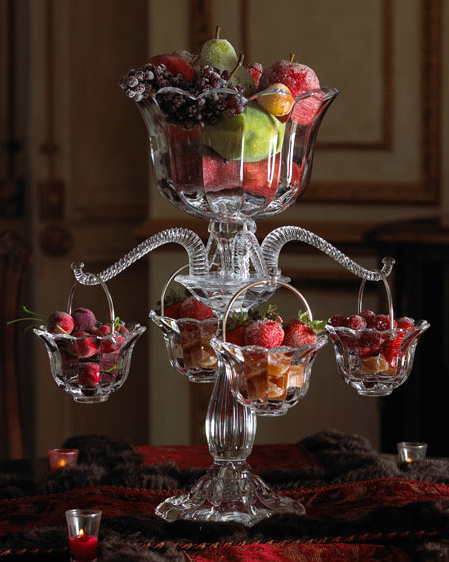 * Épergne: A large table centerpiece consisting of a frame with extended arms or branches supporting holders, as for flowers, fruit, or sweetmeats.